Our exclusive spill-proof plastic playing cards are not only customized to your event but are made from 100% plastic to withstand any liquids. 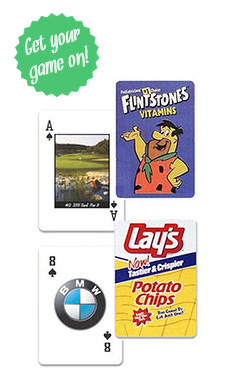 These ultra-premium playing cards are super durable and will withstand many different types of events. You can have your printed playing cards customized in every aspect to offer you truly one of a kind hand of playing cards. These decks of cards even include a custom tuck-box to add to the wow factor. Imprinted on heavyweight 0.30 mm thick tear-proof PVC with different finishes available. Since there constructed of plastic, they are water-resistant and shine well in beverage or water related promotions and events. Contact us to hear more about our free artwork offered to you from our in-house design lab to make sure your custom cards are decorated in a way that will get everyone's attention. With low prices on the hottest items we are your promo people.